for how to buy your tickets online. You should also check fares between major cities on Italotreno. Often, Italotreno fares are cheaper than Trenitalia's. You may even be able to snag First Class (Prima) seats for less than Second Class (Smart) if you start earlier enough. Just remember, that those less expensive seats usually won't allow changes or refunds. Also, I did experience some difficulties completing ticket purchases on Italotreno's site. First of all, the page where you choose your departure and destination cities is in English, but when you click continue after choosing times and the number of passengers, the next page where you choose which train/ticket displays only in Italian. The first two tickets I bought went through without a hitch. After that, I couldn't complete a purchase. In the end I bought our last two tickets on Trenitalia. On Trenitalia, be sure to check the box to proceed "without log-in." Another thing to look for is the "Choose the seat" button which appears over the "Continue" button. Otherwise your seats will be assigned without your input. Just take your time. I'm going to include some photos here of some of the Trenitalia pages you will be using to buy your tickets. Be sure to use the Italian spelling for the cities/towns you're visiting. It's also good to know beforehand if a city has more than one train station and which station you want. Many times, you'll want the station with "Centrale" in its name. Usually, that's the main train station near the city center, but your lodging may be nearer to another station. Check that out with your hotel or apartment rental office. Tripadvisor and/or other travel sites can also help you to determine which station you need. As you do this, you can also learn directions for entering/exiting a train station you'll be using. It's pretty easy asking a question or finding an answer in a Tripadvisor forum for the city/area you'll be visiting. Start here at the Trenitalia English (EN) page. Choose "One Way" or "Return" for round trip; your departure station and your destination station, your dates, the approximate hours you'd like to leave and the number of tickets (adult & children). Then click "Search." 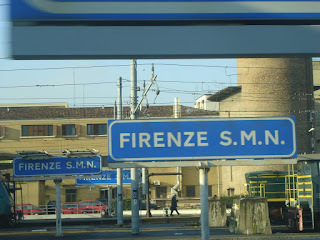 Since we're flying into Linate Airport in Milan (Milano), and taking the train the next day for Florence (Firenze), I've chosen Milano Centrale station which is close to our Hotel Mythos and Firenze Santa Maria Novella station (SMN) which is close to the city center in Florence. On the next page, you make your choice (solution) for which train to take. For our purposes, we will choose the Super Economy Frecciarossa option for 69,80 euro for two adults. (I waited a few days to book this ticket and the Super Economy fares were sold out for the time we wanted, so our price went up by 10 euros. However, other departures were still available for 59,80 euros later in the day). Hover your cursor near the price and the "choose" option pops up for you to click. If your getting a "return" (round trip) ticket, you'll have to "continue" to choose your return trip details. You can see that the trip will take 1 hour and 39 minutes - in our experience, the fast trains in Italy like the Frecciarossa are almost always on time to the minute. We try to time our departures when going to another city so that we'll be able to check into our lodging right after we arrive. Sometimes there is more flexibility on check-in times with self-catering apartments than with hotels. Hotel Mythos in Milan was very accommodating when we requested in advance for an earlier check-in time. They also were willing to hold our luggage in a safe place if the room was not yet available. Either way, no worries. So far, this is what our "Cart" looks like. We have heard that there really is little difference here, so we choose the "I continue without change" option. Choose your payment option here and click "Accept." And, on the next screen choose "purchase without registering," and fill out all of your information with the same email for all passengers. After you hit the "Confirm" button for payment, you'll receive an email immediately or very shortly thereafter with your ticket and all the information. I just completed my first ticket purchase for this trip and the process was easier than previously so you should have no problems. One thing that I missed on this one, though, was the option of picking our seats, but the ones we were assigned look fine. So, we're all set for the second leg of our journey. We have our plane tickets and our hotel reservation for our first night in Milan. On our second day, we'll check out of the Hotel Mythos, grab a coffee and a brioche at the station and board the Frecciarossa for bound for Firenze. Special Note: After (not before!) making my purchase, I looked at my notes for train fares I had researched to find a notation about the Italotreno fare between Milan and Florence. The price for two just 39 euros! As I have said in a previous post, these Economy fares often don't allow changes or refunds. Since the price I already paid is more than double, I put in a call to my credit card company just to see if I could cancel payment on the ticket, explaining that it was really my mistake. The charge had yet to be posted, so I'm waiting to see what happens. Meanwhile, I called Trenitalia and I'm waiting for a call-back now. I imagine we'll just have to live with the higher priced ticket and it's no major problem, but I share this as a cautionary tale to take your time when buying tickets or making reservations. I had done the research, but neglected use it. Special Note Update: I decided not to pursue the cancellation of our Trenitalia ticket. The mistake was mine and I had accepted the Trenitalia ticket restrictions. So, I just moved on from there this week to buy our three remaining tickets online: Florence to Naples, Naples to Bologna and Bologna to Milan. In the end, two of our tickets are on Trenitalia and two are on Italotreno. Once you're traveling on the train, look for signs like the ones in the above photo in case you don't hear the announcement for your stop. Thanks so much Barry! I'm looking into tickets from Milano to Bolzano, so this info is great! Have fun. This must be from you Lori G. Hope the info is useful. We're getting excited about our trip!